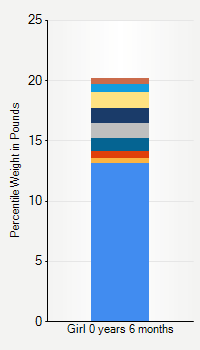 This chart shows weight percentiles, according to the CDC, for girls 6 months of age. To determine an individual's percentile, find the range that includes their weight. This percentile is not a reflection of optimal weight for an individual, it is only for comparing against a population sample. Use the navigation links above the summary chart to view the weight chart for a different age, or to switch between boys and girls or pounds and kilograms. Learn about tracking your child's growth for free! For people over the age of 20, please refer to our adult height-weight charts. Your body mass index (BMI) is a good indicator of a healthy weight, to find out what your BMI is, and what it means try our calculators page. Age-Weight data from the Centers for Disease Control and Prevention website.